Navigating underwater is a whole lot easier than you might think – once you know how. And, as a added bonus, knowing where you are, where you’re going and how to get back again, is a great way to make new diving buddies – quickly. The PADI Underwater Navigator course brings plenty of fun and big rewards while finding your way, learning skills, tricks and tips that’ll have everyone following you. The PADI Underwater Navigator course counts as one of the five Specialties for your PADI Master Scuba Diver rating and counts towards your PADI Advanced Open Water certification at The Dive Bus. Pre-requisites: Minimum 10 years old; PADI Open Water certified. Duration: Training dives: 3 (2) - Days: 1.5 (1). Save time + money: tag on your PADI Enriched Air Nitrox Specialty course. Can I take this course? You can take this course once you’re a PADI (Junior) Open Water Diver, minimum 10 years old. Can I start learning right now? Sure, this way you can spend your precious vacation time DIVING not studying, so you can get started right away once you're here in sunny Curacao. Pick up your PADI Underwater Navigator Manual from your nearest PADI dive shop back home. Or swing by and pick yours up from The Dive Bus, as soon as you're in sunny Curacao. It's included in the price of the course and you can read it on the beach. 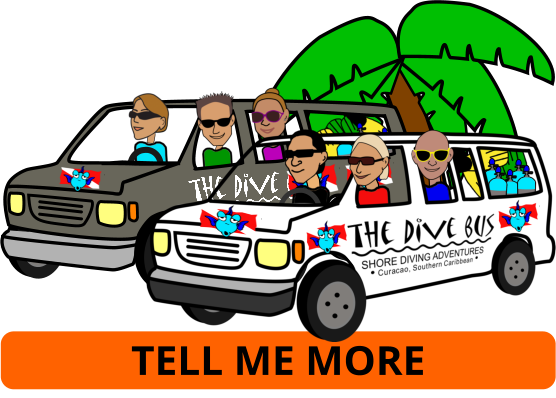 Your Dive Bus instructor will review everything with you to ensure you're comfortable, before heading out to get started on your training dives. What equipment will I need or use? If you don't have your own, excellent quality basic scuba equipment is included in the price of your course. You'll learn how to use a compass and a slate too, and since - as a PADI Graduate - you get discounts on brand new dive equipment - pick up your own that work for you, from the Dive Bus retail shop. What’s next after this course? Open Water certified? Take your Advanced Open Water course for a broader taste of some of the other fun, underwater activities you can enjoy, learn more skills and increase your confidence. Each Specialty Diver certification you have counts as credit towards your Advanced Open Water course. Advanced Open Water certified? here are heaps of PADI Specialty Dive courses to enjoy and each moves you one step closer to earning the coveted status of PADI Master Scuba Diver: the highest certification level for recreational scuba divers. Check out the very important PADI Dive Course Paperwork here, and download the PADI Medical Statement and Questionnaire. Check out the Medical Statement thoroughly to ensure you have no contra-indications for scuba diving and that you're in reasonable physical health. If you're not sure, check it out with your doctor before leaving home. PADI's strict safety standards prevent us from being able to train you without you being in reasonable physical health. All set with your Medical Statement? Great! Now book it, Danno. ...if you're already PADI Open Water certified, the PADI Enriched Air Nitrox course teaches you how to stay down for longer, safely - and fascinatingly. ...exciting, mysterious, unknown. Learn how to go there, safely and confidently. What are you looking at..? ...if you're already PADI Open Water certified, things are different when you dive deep. Know what you're looking at. Fascinating, fun and practical. If you love your Wreck and Deep Diver Specs, you're gonna love this one. Learn how to explore in the dark, safely. It's a whole different world at night. Discover for yourself. Explore sunken pieces of history, hidden from the rest of the world and discover their stories. It's a privilege few are afforded. Learn how to do it safely, respectfully - and legally. Safety is a priority and we reserve the right not to certify students whom we believe are unsafe divers or otherwise don't meet the standards set out by PADI. ... and spend your vacation diving, not studying. 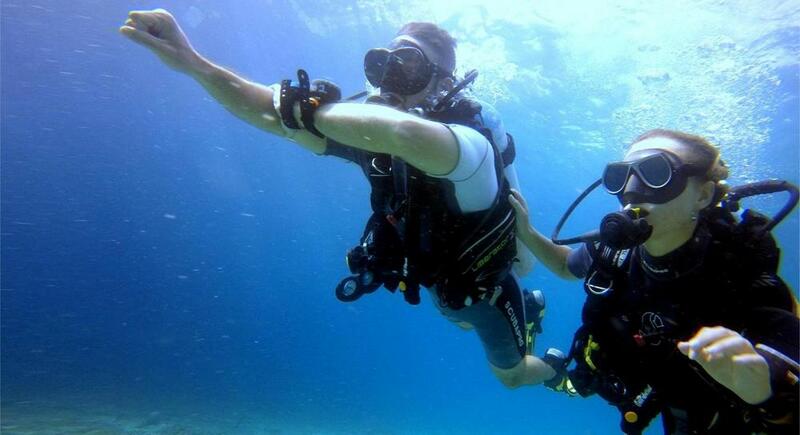 To keep diving safe, divers need strong wrists.